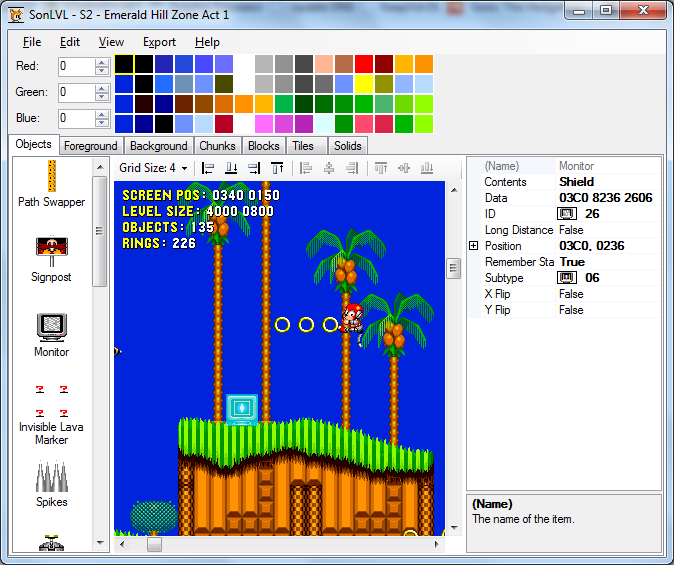 SonLVL is a level editor for disassemblies of Sonic 1, Sonic 2 and Sonic 3 & Knuckles (additionally supporting S&K Collection and Sonic CD PC). It is designed based on Visual Studio, for people that don't like SonED2's interface. It uses art and mappings data from the disassembly to display objects more accurately than SonED2 can. jubbalub, FireRat, CaveQuest and 1 other person like this. Ill test that, now Ill download... why the Hivebrain's disassembly is not supported? Looks nice, although someone needs to make this stuff for OS X, or at least Linux. I tried it, seems like solid work! I like it. Because you're a wanker =P But no really, the Hivebrain disasm is terribly outdated, isn't it? Because it takes too long to convert the INI/CS files, because a lot of files moved, and labels changed. I've said on Retro, you guys could convert them yourself, and put them on the SVN for everyone to use. If it was SonED2 I guarantee somebody would. Edit: And it would work on Linux, except that Mono's GDI+ is buggy, and corrupts the graphics. This reminds me, I am still having an issue with saving the levels using this program. System.IO.EndOfStreamException: Attempted to read past the end of the stream. This happens after I save then attempt to reopen the level. It shows up scrambled in the built game, shows up fine in SonED2. And I told you, it's a bug in KENSSharp, talk to FraGag about it. Personally I think this level editor looks very promising as it is now. It certainly has come a long way in a very short time. I really like more than anything the way you can use graphics/mappings for the objects. The way SonED2 does this makes adding new graphics for objects a bit of a hassle. Keep up the good work on this. can someone tell me the difference with a 'Red Spring' and a 'Red Spring Twirl'? I personally prefer this level editor over SonEd2. Much cleaner and being able to work in a maximised window is a plus. And, as Rika mentioned, adding objects is a lot easier than it is in SonED2. A real winner. Twirl indicates that Sonic/Tails will use a twirling animation instead of the normal springing animation. So it's been a while since I posted here, but S2LVL has been renamed to SonLVL, and can now edit and import art, and edit collision. Hey MainMemory, I don't know if you keep up with this thread, but when I open a Project 128 level up it inserts an extra blank chunk into the chunk list and all the chunks in the layout view are displayed wrong. Are there SonLVL definitions already made for Project 128? They would use Sonic 2-like definitions (if they exist, which I'm not entirely sure). They do exist, and they use Sonic 1 definitions, with Sonic 2 overrides for chunk and layout format. The problem is, SonLVL checks the game type to determine whether to automatically add a blank chunk. I've changed it to check the chunk format, and uploaded it. There also seems to be a similar problem with displaying the collision, there's only an option for path 1 and it doesn't work. Hi, it's been a while since I've posted here, but I should probably start posting updates here too. LevelConverter allows you to change level data from one game's formats to another. There's also a SonED2 object definition converter that converts SonED2 object definition files to SonLVL definition files. Changed format of xflip and yflip parameters in XML ImageRef class. Additionally, the Object Definition Editor is now available for public use. As usual, this does not mean it has been thoroughly tested (I did test it a bit though), so it may crash. There was an API bug that prevented angles from being loaded or saved (affects SonLVL and LevelConverter). The tile list now uses the colors of the palette line you have selected instead of defaulting to line 3 (SonLVL). You can now add an INI file named <ininame>.user.ini (for example S2LVL.user.ini for S2LVL.ini) which will add/overwrite groups/values from the default INI (SonLVL, LevelConverter, ObjDefEditor). Additionally, the resize level function has been moved to an item in the Edit menu. SonLVL, the object definition editor, the SonED2 objdef converter, and most of the object definition files have updated. All three programs now support a "default subtype" value, which means that objects which require a certain subtype can now be placed without having to specify. The "Remember State" and "Debug" checkboxes in the object definition editor did not actually do anything. This has been corrected. SonLVL's Objects tab now has a list of object types on the left side, which can be dragged in to the level to place that object.